The Kronos Quartet performing "Beyond Zero"
The weather outside may yet be frightful, but inside most movie theaters, it’s nice and toasty. (Except for the Palace 9 during my weekend viewing of Jupiter Ascending, during which I had to use my coat as a laprobe. What’s up with that?) Venues all over the state this week present warm, movielicious treats in store. Among the film offerings this week, perhaps the most intriguing takes place just over the state line at the Hopkins Center for the Arts in Hanover, N.H. 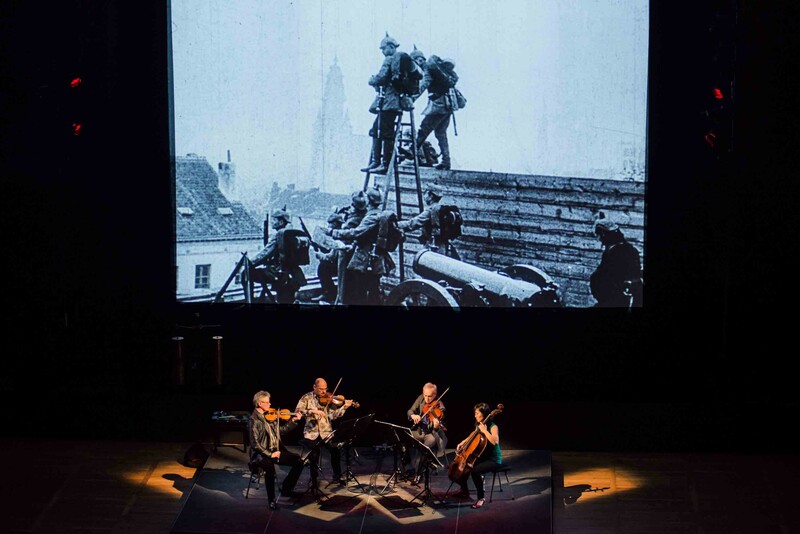 The Hop itself commissioned The Kronos Quartet in “Beyond Zero: 1914-1918,” a multimedia artwork that brings together the acclaimed neoclassical group, the Serbian-born composer Aleksandra Vrebalov and the talented filmmaker Bill Morrison. Morrison is known for finding the inherent, bizarre beauty in old and decaying films, a subject he explored most memorably in the unique film Decasia, which exists at the crossroads of documentary and experimental film. On January 20, A Path Appears, the documentary about women who break free from the yoke of forced prostitution, played at Johnson State College; if you missed it there, you have another chance to see it this week in Burlington. The film will screen for free at the Fletcher Free Library at 6:30 p.m. See fletcherfree.org for more information. Another film playing locally on Valentine’s Day may not necessarily be the best date movie in the world, but it certainly attracted a lot of attention in indie-film circles over the last couple of years. Noah Baumbach’s Frances Ha, starring indie darling Greta Gerwig (who also coscripted the film), plays for free at the Hirschfield International Film Series at Middlebury College at 3 and 8 p.m. The film is sort of about … nothing, really. A young woman in New York City has friends and wants a better job and is charming and quirky. As you can probably tell, this film does not do much for me, but I’m an old crank. Don’t listen to me. Also, get off my lawn. For the continuing Architecture + Design Film Series at Burlington City Arts, VTIFF presents the documentary 16 Acres, about the design and rebuilding of New York City's Ground Zero site. The film recounts the story behind the massive, complex, decade-long, $20 billion project that has transformed lower Manhattan. It plays at 6 p.m. at 135 Church Street. The screening is free, but the pre-film cash bar (by definition) is not; stick around afterwards for discussion. Frances Ha, and Jupiter Ascending are not showing in any theaters in the area.